Burrus has a history of providing high yielding Hoblit and Hughes Brand LibertyLink® soybeans within our lineup, and now we are offering a Power Plus® Roundup Ready 2 Xtend™ soybean variety as well. We know the genetics that we have chosen are competitive, but how do the herbicide systems compare for these two very different trait technologies? 1. XtendiMax™ with VaporGrip™ Technology was the first "over the top" dicamba herbicide approved for use with Xtend™ soybeans, but only for two years. DuPont’s FeXapan™ herbicide has also just granted a supplimental label. It is similar to XtendiMax with VaporGrip Technology. Both contain a DGA salt to reduce volatility. BASF’s Engenia™ is also approved and their BAPMA salts may further reduce volatility risk. 2. 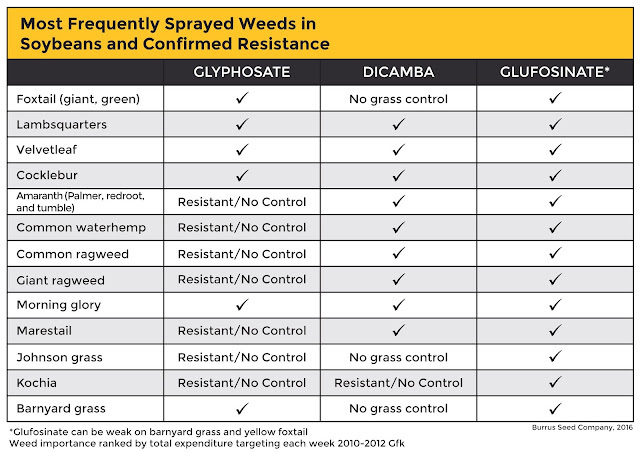 These dicamba based herbicides are considered to be more volatile when compared to glufosinate (Liberty®). While the DGA and BAPMA salts reduces volatility, it is not less likely to drift. The reduction of drift will be dependent upon the spray operator following the herbicide label, which is the state/federal law. 4. Stewardship is important for both herbicide systems. Diversified weed control strategies should be implemented within the same growing season to help deter the selection for weed resistance. Multiple herbicides with different sites of action and overlapping weed spectrums should be used. The use of a pre-residual herbicide product is recommended for both herbicide systems. Dicamba may offer more residual properties when compared to glufosinate, but is very water soluble. Rain can eliminate dicamba's presence in the soil. 5. Both of these herbicide systems should be applied before soybeans bloom, although the XtendiMax label restrictions will likely result in fewer days favorable for application when compared to the glufosinate herbicide system. 6. Both herbicide systems should be applied when weeds are small (below 3 to 4 inches; see each herbicide label for details). While the Liberty label consists of approved herbicide tank mixes, we anxiously watch each of the websites to for approved tank mixes for the dicamba based herbicide systems. This raises concerns about grass control with the dicamba based products and if needed, will need to be made in a seperate herbicide application until approval is given. 8. No products with ammonium salts, such as AMS, can be applied with the dicamba based herbicides because it could cause negative affects and increase drift potential. Adjuvants such as AMS are required with Liberty to aid with coverage. 9. The biggest difference between these two herbicide systems is that XtendiMax will require a downwind buffer, 110 or 220 feet depending on the rate of application. Engenia will require a 110 foot downwind buffer. So, a buffer consisting of roads, corn, dicamba-resistant crop, prep fields, or man-made structures will need to be used if wind is blowing towards soybeans without dicamba trait. No application of XtendiMax or Engenia can take place if winds are blowing towards a sensitive crop such as grapes, tomatoes, or fruiting trees. 10. Overall, with both herbicide systems, spray timing will be important, and there will be tank clean out concerns and water needs. However, with the XtendiMax and Engenia herbicide system, there will be more risk, importance of wind speed and direction, and need for buffers. Ultimately, the applicator is responsible for drift. Some additional considerations will be seed genetics, seed cost, retailer availability of herbicide product, as well as application, generic herbicide availability, herbicide guarantee and rebates offered by chemical companies. Stay tuned for more information DuPont's FeXapan .